BEFORE: As it comes time to wrap up this Coen brothers chain, I’m taking the time to revisit two of their films that I have already seen. The first is The Big Lebowski starring Jeff Bridges (who is new to the marathon) and Coen regulars John Goodman and Steve Buscemi (both last seen in yesterday’s Barton Fink). I remember finding the film quite amusing the first time watching it and I’d like to relive that experience and analyze why I liked it. AFTER: Watching The Big Lebowski a second time, I’m surprised by how little I enjoyed it. Looking back, I thought I was laughing pretty much the whole way through finding every little action and every retort to be hilarious. Seeing it now, I find that to be less true. This is not to say The Big Lebowski lost all of its charm or humor; it still has plenty of that. Walter (John Goodman) is by far my favorite character of the film. Most of my memories of the film were of his character and so it makes perfect sense why I recalled the film as being all funny - because Walter is. Everything Walter does I found instantly funny: his actions (the reaction in the bowling alley), his dialogue (especially when talking to Donny (Steve Buscemi)), and even his change in demeanors (his confrontation with Larry). Some other great characters come in the way of Jesus (John Turturro), Brandt (Philip Seymour Hoffman), and the aforementioned Donny. But it’s the parts that my mind just forgot or looked-over that lower The Big Lebowski from the pedestal I had it placed on. Most of these scenes are the psychedelic/stoner montages of the Dude doing various things while high. The scenes are done very well and certainly fit in with the tone and style of the film; for that I give the Coen brothers big props for. But they weren’t funny and always took my away from the rest of the story that was unfolding. Other scenes that come to mind are pretty much any that don’t take place in the bowling alley. 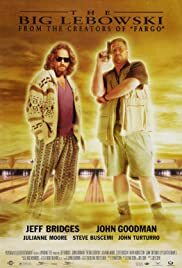 Now the bowling alley wasn’t the only good part about The Big Lebowski, but I think everything that happens there far outshines the rest of the film that it’s hard to compete. The Big Lebowski has some extreme highs (both literally and figuratively) but also some extreme lows. The bowling alley is filled with some of the best comedic gold I’ve ever seen/heard but the rest of the film just pales in comparison. Still, The Big Lebowski should definitely be on your list of films to see as it is a big cult classic that is pretty decent. Now if you’ll excuse me, someone soiled my rug and I need to replace it.